3 chambres, 1 1/2 salles de bains, l'océan et la montagne. Sun Deck. 3 chambres, 1 lit queen, 2 lits simples de luxe avec tapis et placards. Plus1 petite chambre pour enfant disponible, sur demande. Salon avec vue sur Bird Islands pouvant accueillir 5 personnes. Coin salle à manger pour 5 personnes, Cuisine équipée avec réfrigérateur, cuisinière, micro-ondes. 3 tabourets de bar, tous les ustensiles, vaisselle etc. Salle de bain avec lavabo douche à main, wc. Salle de bain en bas. Salle de bain complète avec WC, lavabo, baignoire / douche. miroir de courtoisie, armoire murale. point de rasage Demi salle de bains avec WC, lavabo, point de rasage. Das Buchanan House war sehr schön und die Vermieter waren sehr nett und hilfsbereit. So wurde z.B. sofort der eigene Grill zur Verfügung gestellt. We loved our stay at this beautiful home. It is comfortable, clean, well-equipped, and in a lovely setting. The Butterworths live nearby and were extremely helpful in their recommendations for sites to see and restaurants to try. They also shared their knowledge of the local gardening and quilting scene which was of particular interest to us. One of our main reasons for choosing VRBO rentals is the enrichment of meeting and talking to local residents about their lives, culture, and interests. So these owners and their home definitely added a perfect experience to our Canadian adventure! A previous review stated that the property was very clean, unfortunately we found many kitchen appliances to be dirty, cobwebs throughout the house, and dirty window sills. Big comfortable living room and dining area though. The bedrooms all have slopped ceilings which isn't a problem except for the 4th bedroom which is very tiny. No laundry allowed even though laundry machines are on the property. There is only one shower/tub which is quite squishy because the roof slopes leaving only a 1 1/2 x 2 foot area to stand up straight in (not great for tall people). Very nice owners though who live in the house right in front of rental property. Buchanan House is a centennial farmhouse built by the descendants of the original settlers from the Western Isles of Scotland who came to Cape Breton Island after their lands were seized and homes put to the torch during the period known as “the highland clearances”. The roof is high-pitched to help to shed the heavy snowfalls of our Eastern Canadian winters. This results in the ceilings in some of the rooms on the second floor having a slope or a dormer window incorporated. To our educated guests, this offers a unique experience heightened by inclusion of a wood stove and artifacts that include horse tack, bridles, girth straps and brasses as well as old carpenter’s tools and an iron plough share broken by the rocks and boulders in the meadow beside the house. There are also copies of books the settlers would have read in the long winter evenings written, of course, in Gaelic. We have a display of original photographs of the house and the last members of the Buchanan family to live in our lovely home. Our returning guests (and the numbers are fast increasing) spend most of their time and energies exploring our beautiful island with its sensational landscapes and seascapes, its hiking trails, sandy beaches, whale sightings, the magnificent fortress at Louisburg, and unique fiddle music. Some attend activities at the nearby Gaelic College where they learn the basics of the language, its music, its arts and its crafts that include local hand-made musical instruments and remastered Scottish musical scores. Rather regrettably, our guests seem to have judged the success of their visit to our island in relation to the dimensions of the bedrooms or the ceilings that they carefully measured or the bathtub design or the number of cobwebs (real or imaginary). They offer gratuitous advice on the layout of our home or the use of our washing machine. For the record, other guests at Buchanan House this summer found no evidence of cobwebs and the only dirt we, the owners, found was that left by the guests of July 20th. Did they learn a few words of Gaelic, attend a Ceilidh, take a walk along the splendid North River, see the bald eagles or watch the gannets diving for fish? I sure hope so. We were 4 retired women artists traveling for a week to discover the beauty, music, and art of Cape Breton. This is a lovely house on the Cabot Trail near some great artisan shops. Roger met us and was a great source of history and practical tips for the area. On the other hand, Sandra was less than gracious when I met her on our last morning. In contrast to everyone else that we met and had dealings with on Cape Breton, she was unhelpful and rude. Avoid her if at all possible. 3 of the 4 beds were comfortable, one should really be replaced because of the hardness and springs showing. We placed multiple blankets and quilts over it for our second night so it could be slept on. So again, the house itself and the welcoming from Roger was a great start to our trip, but that part just didn’t end as well as it could have. These hurtful comments to my wife and criticisms of our home are disingenuous and motivated by frustration due to a ferry cancellation prior to arrival in Canada. I have been looking into how to request a refund for the night we didn't stay in your lovely farmhouse due to the Portsmouth-Yarmouth Ferry weather cancellation. We had reserved 13-16 but couldn't get there until the 14th. Your wife suggested I contact (the agency) directly to request a refund, because she was under the impression that was the policy. But actually it is in your control (web address provided). We found the people of Cape Breton to be warm and welcoming. Clearly this is up to you whether you will refund 1 night, or even a partial of 1 night. However, it would be much appreciated on this end, and will guarantee a great review of the lovely property. We are so very happy that you enjoyed your stay and that you found our home lovely and the people of Cape Breton warm and welcoming. Concerning any refund which you feel you may be entitled to, we suggest you start by checking your travel/cancellation insurance policy carefully since it is likely that cancellation of the ferry crossing due to weather would be covered. We have found this to be the case following flight delays and cancellations, as well as ferry crossings. Before continuing further, we would be obliged if you could check your insurance policy in this regard. As you no doubt remember we did offer you an additional night’s stay at our property at our expense to compensate you for your loss due to the ferry crossing delay. Unfortunately, our offer was declined. Regarding your offer of a guarantee of a great review of our lovely property, conditional on our payment of a fee, we find that this goes counter to the basic principles of good business practice and, quiet frankly, is insulting. We look forward to hearing from you regarding your travel insurance. Until 7/24 our home was “lovely” and the people of CB “warm and welcoming”. In their Home Away revue of 8/11, our “lovely farmhouse” got a 2-star rating; our lowest on record. They were true to their word; no doubt a refund would have” guaranteed a great review”. No thanks. PS. The deadline for the refund has now expired. Pro's: up to 4 rooms to stay in, Clean, Spacious, Close to Cape Breton Park, Easy access. Con's: Rules regarding limited water use and trash disposal. Grill with no fuel. No Air Conditioning, Upstairs confined with low ceilings, Outdated amenities, Maintenance concerns. Road noise and owners use of adjacent garden early hours. General clutter of old clothes, felt like staying in someones house they live in. Happy to hear that the Smith family enjoyed their stay. Certainly the interactions that we had with them lead us to believe that all was well. No mention was made at any time of lack of amenities or of maintenance of property or of difficulties understanding the house rules regarding the availability of the use of water or guideline issued by Victoria County, regarding waste disposal. The old clothes referred to are 3 wet weather k-way available to all visitors should they have not packed sufficient gear for wet weather. The only clutter and clothing in the house was that left behind by the Smiths. The Buchanan House is our home and is a centennial farmhouse built in the traditional style. It is a protected property with a certain number of low ceilings in some places always judged to be charming by our Canadian and American guests. Quiet possibly the Smith family would have been happier in one of the multitude of motels available along the Trans-Canada highway. 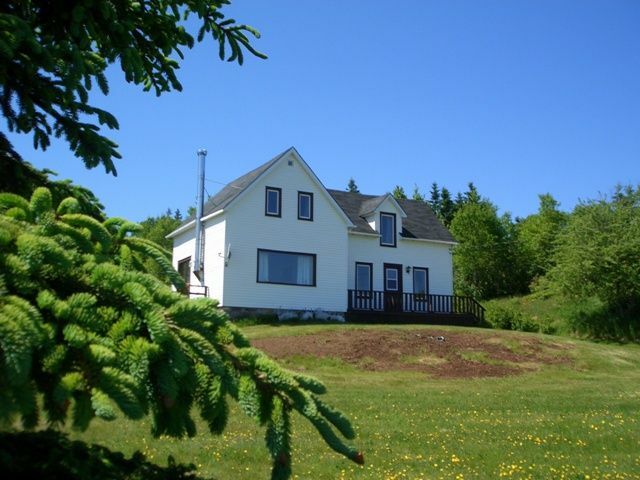 Roger and Sandra's house is the perfect base for exploring the Cabot Trail. It retains its traditional charm but also has many welcome modern touches. It’s cozy and super-clean, and they were warm and welcoming hosts. From the deck you have a super view of the ocean -- and friends who pass by on the road — and you can walk to the Clucking Hen and several artisan shops. Thanks, Roger and Sandra! Randonnée vaste, randonnée dans le bush, observation des oiseaux et promenades sur la plage, sur la propriété. 3 min. à pied à la boulangerie / épicerie / restaurant avec wi-fi. Point de départ idéal pour des événements Cabot Trail y compris Ceilidhs, Festival celtique de couleur, (Octobre), Musée de la Cloche, de Baddeck, Forteresse de Louisbourg, Highlands National Park, plages de sable, Golf. Property for rental June - October.